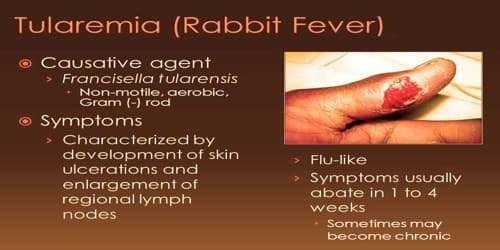 Definition: Tularemia, also known as rabbit fever, is a disease of animals and humans caused by the bacterium Francisella tularensis. It is a rare infectious disease that typically attacks the skin, eyes, lymph nodes and lungs. Humans can become infected by having direct contact with an infected animal or from tick, mosquito, or deer fly bites. The disease is caused by the bacterium Francisella tularensis. It can be life-threatening. The disease is named after Tulare County, California, where the disease was discovered in 1911. The tularemia bacterium was first isolated by G.W. McCoy of the United States Public Health Service plague lab and reported in 1912. 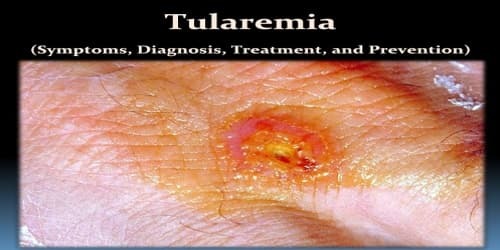 Scientists determined tularemia could be dangerous to humans; a human being may catch the infection after contacting an infected animal. The ailment soon became associated with hunters, cooks and agricultural workers. A number of other animals, such as rabbits, may also be infected. Symptoms may include fever, skin ulcer, and enlarged lymph nodes. Occasionally, a form that results in pneumonia or a throat infection may occur. The various forms of tularemia are distinguished by where the bacteria enter the body. The most common form of the disease is caused by skin contact with the bacteria. The deadliest form of the disease is caused by inhaling the bacteria. Prevention is by using insect repellent, wearing long pants, rapidly removing ticks, and not disturbing dead animals. Treatment is typical with the antibiotic streptomycin. Gentamicin, doxycycline, or ciprofloxacin may also be used. 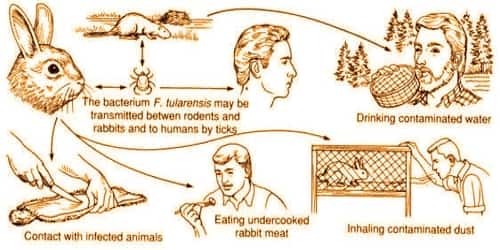 Signs and Symptoms of Tularemia: Depending on the site of infection, tularemia has six characteristic clinical variants: ulceroglandular (the most common type representing 75% of all forms), glandular, oropharyngeal, pneumonic, oculoglandular, and typhoidal. All forms are accompanied by fever, which can be as high as 104 °F. Each type of tularemia has its own set of symptoms. Glandular Tularemia: Similar to ulceroglandular tularemia but without an ulcer. Also generally acquired through the bite of an infected tick or deer fly or from handling sick or dead animals. The incubation period for tularemia is one to 14 days; most human infections become apparent after three to five days. 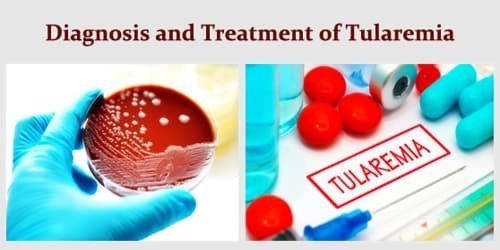 Diagnosis and Treatment of Tularemia: Tularemia can be difficult to diagnose. It is a rare disease, and the symptoms can be mistaken for other, more common, illnesses. Doctors may check for F. tularensis in a blood or sputum sample that’s cultured to encourage the growth of the bacteria. Sometimes tularemia can be identified by antibodies to the bacteria in a sample of blood, but these only develop several weeks after infection. Tularemia can be effectively treated with antibiotics such as streptomycin or gentamicin, which are given by injection directly into a muscle or vein. Depending on the type of tularemia being treated, doctors may prescribe oral antibiotics such as doxycycline (Oracea, Vibramycin, others) instead. There is also tentative evidence to support the use of quinolone antibiotics. Preventions of Tularemia: There are no safe, available, approved vaccines against tularemia. However, vaccination research and development continues, with live attenuated vaccines being the most thoroughly researched and most likely candidate for approval. Sub-unit vaccine candidates, such as killed-whole cell vaccines, are also under investigation; however, research has not reached a state of public use. Don’t skin or dress (remove the organs of) any animal that appears to be sick. Wear gloves and goggles when handling any animal. Wash their hands carefully after handling an animal. Use an insect repellent with 20 to 30 percent DEET, picaridin or IR3535, but follow the manufacturer’s directions carefully. Apply insect repellant in moderation, and wash it off at the end of the day.